With the heaviest of hearts I must report that at 11:40 A.M. on February 6, 2005—Super Bowl Sunday—a true American hero, Lieutenant Colonel Mark Freeman Tierney, USMCR (Retired) died in his Lake Ridge, Virginia home as a result of several Agent Orange related cancers. Lieutenant Colonel Tierney, recipient of the Silver Star Medal and the Purple Heart Medal with one (1) Gold Star as well as a host of other combat and service decorations, is one of the finest Marines with whom I ever served during my thirty (30) year Active Duty and Reserve career. Lieutenant Colonel Tierney joined the Marine Corps Reserve in 1964 and after graduation from Boot Camp as his platoon’s Honor Man he was trained as a Communicator, then he reported for duty with a Reserve artillery unit near his home in the Philadelphia, Pennsylvania area. Upon completing college in 1968 Lieutenant Colonel Tierney, though eligible for promotion to Staff Sergeant, accepted a commission and volunteered to serve in the Republic of Vietnam. After he was trained as an Infantry Officer and Vietnamese linguist, he reported for duty as a Platoon Commander with Mike Company, 3rd Battalion, 7th Marine Regiment, 1st Marine Division. Subsequently Lieutenant Colonel Tierney served as a Civil Affairs Officer for Headquarters, 1st Marine Division and made many trips into Khe Sanh to help the people there. While I did not have the good fortune to meet Lieutenant Colonel Tierney until 1991 when we were both mobilized for the Gulf War—he was the II Marine Expeditionary Force (II MEF) Staff CounterIntelligence Officer and I was the 2nd Marine Expeditionary Brigade (2nd MEB) Intelligence Chief—I was fortunate to serve under him near continuously from that point until he retired from the Marine Corps in 1995 after more than thirty one (31) years of officer and enlisted service. While he was my senior in the Corps, in life I was extraordinarily fortunate to have him for a mentor and a friend; he is the first person I could ever talk to about the events occurring at and after LZ Margo in September of 1968 and the grief those incidents caused me. I have long believed that the measure of the man is in how he treats those who can’t do anything for him in return and that description epitomizes Lieutenant Colonel Tierney; when I was sick last December he is the one who made sure I got to the hospital and then home when I was released, he was the one who took me to have my stitches put in and later removed, then he went into the hospital. While in the hospital he asked me for some addresses and envelopes since he wanted to make advance tax payments so his wife wouldn’t have to and at the same time he made sure he made a donation to our association knowing full well it would be his last one. He died just five (5) weeks later. I will cherish the mentorship and friendship Lieutenant Colonel Tierney gave me until my dying day. In an era when people have a warped idea of leadership, he was the finest leader I ever worked for; his philosophy was simple, give your Marines a job, make sure they have what they need to do the job, then get the hell out of their way and let them accomplish their mission; he was never surprised at how his Marines always produced. 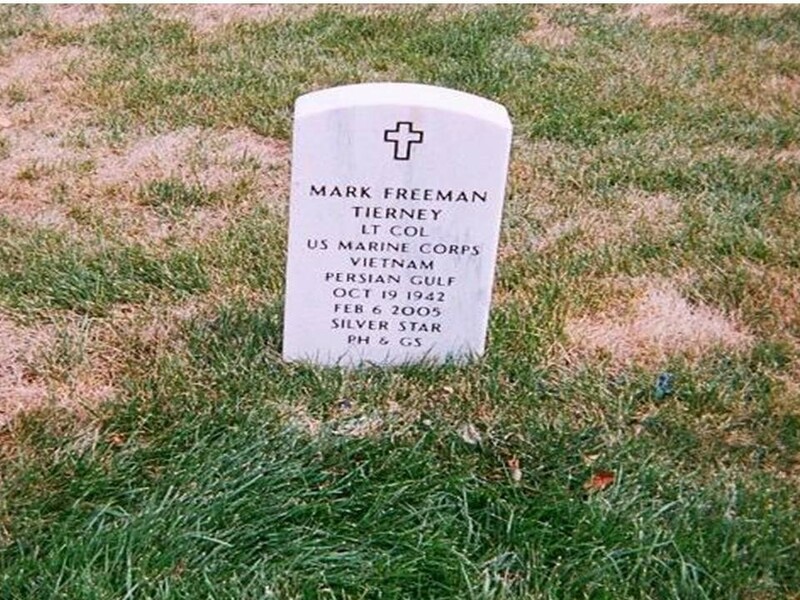 On February 17, 2005, Lieutenant Colonel Mark Freeman Tierney, USMC (Retired)—October 19, 1942 to February 6, 2005—was buried with full military honors in plot 2733, Section 69 at Arlington National Cemetery. God Bless and keep you Colonel Tierney. The streets of heaven are well-guarded now that you’ve reported for duty Sir. SEMPER FIDELIS!! !